Episode 1 - Exile on Main St. Episode 8 - Season Seven, Time for a Wedding! Episode 2 - What's Up, Tiger Mommy? Episode 9 - O Brother, Where Art Thou? One of my favorite tv-shows,its a must watch. dog dean afternoon is the fifth. heaven can't wait is the sixth. and bad boys is the seventh that hasn't even been aired yet. I really love this show. At first I went to their wikia page and read the teasers and found out that it was good. Started watching it here and found out that it was really good. Currently collecting the DVD copies of these so I can watch them again and again at home. S. 8 Episode 12, As Time Goes By - An angel wasted is a terrible thing! Don't the boys have this awesome personal guardian that they can call on in certain situations? Like say - when their father's FATHER shimmies straight through from 1958 to 2013 and is mortally wounded by a demon? Apparently yelling "Call Cas! Call Cas! Call Cas, ya idgits!!!" at my computer doesn't do a lot of good. -Anyway- I am also definitely addicted to this show and my two fellow Texans. DANG & HOLY SMOKES.... I LOVE THIS FREAKING SHOW!! NOW THAT I AM ALL UP TO SPEED AND HAVE SEEN ALL OF THE EPISODES FROM BEGINNING TO END I AM ALREADY JONESING FOR THE NEXT SEASON TO BE IN THE CAN SO I CAN WATCH ALL THE EPISODES ONE AFTER THE OTHER!!! OMG .... 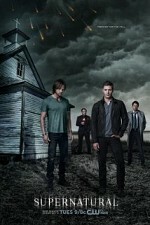 I AM SO ADDICTED TO THIS AWESOME SHOW!!! I HOPE THIS SHOW IS ON FOR AT LEAST 5 MORE YEARS. SOOOOOOOOO HAPPY CAS IS BACK! HOPE WE SEE BOBBY AGAIN SOME HOW ..SOME WAY.